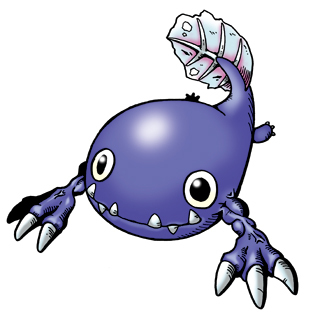 An Amphibian type Digimon whose epidermis stopped hardening because he chose to live a life underwater. He swims across the marshes and rivers of the Net Ocean with his big tail, and sometimes scales up rocks with his developed forelegs to begin his croaking. His almost undeveloped hind limbs act as rudders, helping to produce a strong driving force from his tail, and he seems quite the opposite of other ordinary creatures because of this. His valuable existence will lead to him evolving perfectly in the next foreseeable future during his Rookie stage, but pay attention when you're upbringing him because there's a very high possibility of mutation as well. His special attack is "Lullaby Bubble", which sends the opponent to sleep eternally. 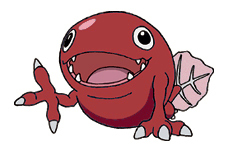 1 In an episode of Digimon Savers, Otamamon was incorrectly labeled as an In-Training Digimon. Origin / Japanese. Otama is short for otamajakushi, which means tadpole. Origin / Japanese. Otama is short for otamajakushi, which means tadpole. A variety of Otamamon that manipulates flame. He likes hot water more than cold, and he loves hot springs. He still scrambles onto rocks to train his vocal cords, though. The Digimon you are viewing now is categorized as a Special Recolor, which means that, unlike Random Recolors, this recolor has an attribute change and was created intentionally. Any attack that is exclusive to a recolor will be listed under the attacks of the original Digimon, with a note next to that particular attack. 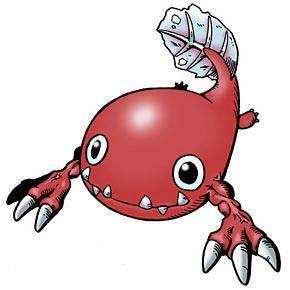 Any evolutions that are exclusive to a recolor will be listed under the evolutions of the original Digimon, except for any recolor evolution seen in the anime, and for the evolution I feel best fits for the recolor.